While it may come as a surprise, the second quarter of 2018 was actually quite strong for stock investors. The S&P 500 rose 3.4%, mid-cap stocks gained 4.3%, and small-cap stocks returned almost 9.0%. Even REITs rebounded in the quarter for a gain of 7.8%. The year-to-date numbers are more modest, as you can see on the nearby chart, but returns are still positive for domestic stocks. Clearly, volatility has been the big story so far this year. While the stock market has moved higher, it has been a roller coaster ride getting there. News headlines about trade wars, Fed interest rate policy, potential inflation, and other worries have whipsawed stock returns. We discuss potential future scenarios for U.S. stocks in our “A Tale of Two Markets” section of this newsletter. The good news is that stocks could rise 30% from here. The bad news is that they could fall 30%. After several years of disappointing returns, international stock markets posted nice gains in 2017, and it looked like they were on the road to a significant rebound. Unfortunately, this year tells a different story. Part of the problem is continued economic struggles in many foreign nations, as well as continuing political strife (think Brexit). However, another significant headwind has been the strength of the U.S. dollar. The negative returns for both developed and emerging market stocks shown in the nearby chart reflect returns to U.S. investors. Returns in local currencies were better, and in fact developed market stocks’ returns were in line with the S&P 500 for the second quarter. Still, the emerging markets posted losses no matter which currency you use to calculate returns. These stocks are notoriously volatile, and subject to large swings in reaction to politics and economics both at home and abroad. The threat of a global trade war currently has been bad news for nations with developing economies that depend heavily on exports. On the bright side, international stocks, particularly emerging market stocks, are quite reasonably priced currently. They trade at valuations far below those in the U.S. Over time, those valuation levels matter, and stocks trading at lower levels tend to generate stronger returns. Many of the alternative investment funds we use are off to a rough start in 2018. It is only half time, and there is still time for them to recover, but given that these are more unfamiliar strategies, many clients are concerned about them. While the returns are generally below what we would like to see, they have provided returns over time that are higher than those of the bond market. 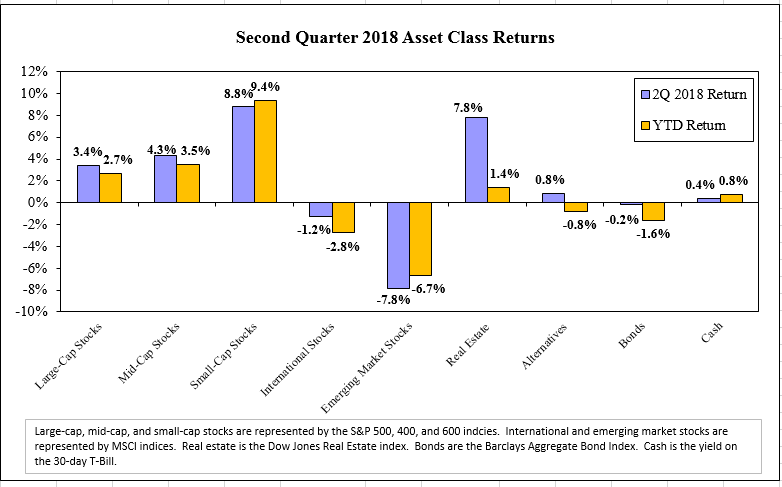 Because we have taken money from the bond portion of many portfolios to invest in alternative investments, the strategy hasn’t resulted in any significant loss of overall return. That said, we expect much higher returns than what we have seen. While we continue to have faith in a number of the alternative funds in the portfolio, we are reviewing others. We remain committed to the diversification and risk control that alternatives offer, but will of course make changes if needed to improve returns. Interest rates rose modestly in the second quarter and more significantly since the start of the year, resulting in losses for the bond market for both the second quarter and year-to-date periods. Rising interest rates, and the threat of future increases in rates have spooked bond investors. Inflation has also been a concern. While still low by historical standards, inflation is starting to tick up by some measures. Rising inflation makes the fixed coupon payments on most bonds less attractive and makes investors less likely to want to buy and hold bonds. As we have discussed previously, the ten-year outlook for bonds is not attractive. However, bonds do offer an important source of risk control, and still have a place in many portfolios. See our article on the possibility of an inverted yield curve for further discussion of the bond market. Like much of the past several years, diversification was more of a hinderance than it was a help so far in 2018. Bonds and alternatives didn’t contribute to returns, and there was no real need to hedge risk as the stock market continued to rise. International diversification was similarly unhelpful. U.S. stocks once again did the yeoman’s work of generating returns. Despite the recent volatility, we have been in a golden age for the stock market. It won’t last forever, so enjoy it while you can. To Download the complete Newsletter please click below.